Split between two continents, separating Europe from Asia, Istanbul is unlike any other city in the world. Straddling the Bosphorus Strait, it is Turkey’s largest city which, strangely perhaps, has never been its capital and is home to more than 15 million inhabitants and over 10 million tourists per year – music to the ears of local food vendors. Originally founded by the Greeks in the seventh century BC, the ancient city is home to some of Turkey’s best restaurants, including many that have retained the skills of the old Ottoman cuisine over the years. Fish is a firm menu favourite – thanks to the lengthy coastline – and snacks are notorious throughout the city with kebab stands, pastry shops and cafes serving up local treats at all times of day. Istanbul’s cobbled streets have served as the capital to four empires over the course of 16 centuries (the Roman 330-395, Byzantine 395-1204 and 1261-1453; Latin 1204-1261; and Ottoman 1453- 1922). With such rich history and a vibrant past, a city abundant with international presence can only mean that an exceptional culinary scene is to be found. He explains: “Istanbul has a big emphasis on regional cuisine, traditional Turkish food.However, the food is also influenced by close-by countries such as Greece, Italy and Syria. The city has a big street food culture, where visitors will find things such as doner kebab (meat cooked on a vertical rotisserie served in bread), shawarma (grilled meat often served in a wrap) and kofte (balls of minced meat, usually beef or lamb, mixed with spices and onions).” During the colder months you’ll be sure to find a lot of winter-warmers around such as soups, particularly those made with lentils like mercimek corbasi (a steaming, red lentil soup peppered with chili and mint). A national drink, tea (cay) comes in all flavours and temperatures in Istanbul. Popular with locals and tourists alike, apple tea is served in nearly all cafes, using the true flavour of apple as a refreshing way to take a break any time of day. It’s also a city where bread is a culture. Freshness is key when it comes to bread in the city and you’re not likely to find many pre-packed options on the shelves. A staple item, bread (ekmek) is most commonly baked twice a day, early in the morning and late in the afternoon so that it can be picked up en route home from work to serve with dinner. “Bread has major cultural significance in Istanbul and throughout the city you tend to see bread everywhere, however there isn’t a wide variety. Instead, the Turks specialise in several breads and they do them well,” explains Ansel. In local bakeries, you’re likely to find breads such as flat bread, pita (pide in Turkish) bread, lavash wafer-thin bread, white loafs, sinit and bazlama, which is otherwise known as ‘village bread’, a popular Turkish bread made from wheat flour, water, table salt and yeast. “I think the sinit, which is somewhat like a bagel, a round, crispy bread coated with sesame seeds ranks top when it comes to bread in Istanbul. This is most commonly eaten fresh for breakfast with cheese and can be bought all times of day off the streets, sold from carts or by vendors carrying wooden trays on their heads,” he added. Often accompanied with a selection of breads, another popular trend in Istanbul is the meze style of eating – mezzes are a selection of small dishes that include things such as hummus, beyaz peynir (white cheese), kavun (sliced ripe melon), acili ezme (hot pepper paste with walnuts), haydari (thick strained yogurt like the Levantine labne), patlican salatasi (cold aubergine salad), kalamar (calamari or squid), cacik (yogurt with cucumber and garlic), dolma or sarma (rice-stuffed vine leaves or other stuffed vegetables, such as bell peppers) and kofte (meatballs). If there’s one thing we can all relate with Istanbul, it’s the famous doner kebab, a traditional Turkish dish made from compressed meat (usually lamb, beef, chicken or veal) that is cooked on a vertical rotisserie, thinly sliced and served wrapped in a flatbread such as lavash or pita. Sliced directly from the spit to order, kebabs are the nation’s most favoured snack and come with a variety of ingredients such as meat, fish and vegetables. “You’ll find kebabs wherever you go in Istanbul, they’re all over the streets on food trucks and in restaurants: it’s very much a kebab town. Visitors can be sure to find kebab joints on all street corners, and each cook in their own unique ways,” said Ansel. There are many variations of the kebab, such as the rian kebab, which involves the slow cooking of a small lamb over coals in a deep hole in the ground, resulting in extremely tender meat covered in a thin layer of crackling. Kebab meat can also be marinated and cooked over a wood fire. Others include the fistikli kebab, consisting of minced suckling lamb stuffed with pistachios, the iskender kebab, which is doner lamb cut into long ribbons served on crumbled pita and yoghurt, topped with peppers plus tomato and butter sauces. Despite being most commonly associated with bread, kebabs are also served with rice or potatoes and often with a hot roasted pepper, much like the tokat kebab which is made up of lamb cubes grilled with potato, tomato, eggplant and garlic. Although seemingly like an average grilled meatball to the city’s visitors, another Turkish favourite and one for the meat lovers is the kofte – minced lamb meatballs with herbs, commonly including parsley and mint. The difference between a good and bad kofte? Be sure to look out for those vendors who bulk up their kofte with breadcrumbs, the crème de la crème of meatballs is found in kitchens priding themselves on serving high meat content. For those who love fish, Istanbul is the place for you, surrounded by the waters of various seas, the city offers over 20 different kinds of fish every season.With plenty of excellent fish restaurants located by the Bosphorus, diners can expect to find certain find a range of different fish in Istanbul, dependant on the month. January: anchovy, horse mackerel, red mullet, whiting. February: bonito and tubot. March: grey mullet and sea bass. April: swordfish. May: sole, shrimp and lobster. June: goby and tuna. July: crab and sardines. August: bluefish. September: bonito and sardines. October: mullet and small blue fish. November: whiting. December: anchovy. “Istanbul is a gifted city when it comes to fish. Every season of the year you can find different kinds of great fish. The locals particularly enjoy the smaller fish like anchovy and horse mackerel, which are most commonly served to visitors in a piece of bread down by the water,” said Ansel. Remember, finally, to buy your ‘evil eye’ when visiting Istanbul, a typical blue and white charm acclaimed for protecting its holder. The old Turkish superstition claims that the evil eye will protect you against those capable of causing you harm because of jealousy, you’re bound to see them all around the city. “All in all, Istanbul is truly a city faithful to its traditions and its local cuisine,” Ansel reflects. Who better to give us an overview of a city’s food culture than a chef? We grabbed a few moments from the busy schedule of Reif Othman, Executive Chef of PLAY Dubai, who is a fan of the destination, to give us some tips on eating in the city. 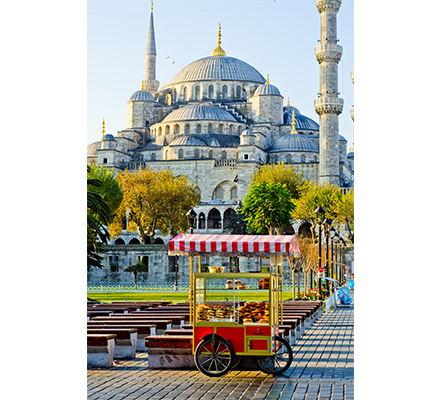 Top Istanbul street foods or snacks? Most common on local streets are kebabs and meatballs, which are sold from small shops or mobile carts. ‘Must ry’ Turkish dishes? I would highly recommend several dishes from the Taksim and Eminonu areas. I’d definitely suggest the stuffed mussels, fish and bread in Eminonu with pickle juice or kokorec (lamb intestines). Most surprising thing about he food in Istanbul? The locals consume a lot of yoghurt, organs and vegetables. Generally, a cold yoghourt drink called ayran is always preferred and consumed with any meal. Which hot drink is most common? Mostly black tea is preferred. Whilst on trips throughout the city, they tend to offer black tea or Turkish coffee. Restaurant recommendations? For Turkish cuisine, I recommend the Hatay Sofrasi and Borsa restaurants, these are two of my favourite hotspots I like to visit. And Zuma, of course!